Every year since I started this blog I have honored those who lost their lives on this day in 2001. Two of those planes, American Airlines Flight 11 and United Airlines Flight 175, were crashed into the North and South towers, respectively, of the World Trade Center complex in New York City. A third plane, American Airlines Flight 77, was crashed into the Pentagon, leading to a partial collapse in its western side. The fourth plane, United Airlines Flight 93, was targeted at Washington, D.C., but crashed into a field near Shanksville, Pennsylvania, after its passengers tried to overcome the hijackers. In total, almost 3,000 people died in the attacks, including the 227 civilians and 19 hijackers aboard the four planes. We also lost 343 firefighters and 72 law enforcement officers, the deadliest incident for their fields in the history of the United States. Some managed to call home and tell their loved ones they loved them one last time. Some despaired and jumped; others never knew what hit them. We will never know what they thought, how they felt. That is a world sacred to those who have gone before us. We will always ask, “Where were you when you heard?” Our hearts will always hurt when we watch the Towers crumble. And we will always be ashamed of those who called themselves human beings and did such a thing. 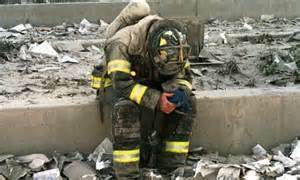 We also will never find the words to thank those who put their lives on the line to save what they could. We will always be amazed that Mother Nature reclaimed her wounded ground in Pennsylvania so peacefully, and that her human counterparts did the same with the Pentagon and Ground Zero. I will never forget. And as long as I have a blog, I will never let you forget, either. Amen Claudia ! We must never forget! A painful day to remember, but one we should never forget.